Independent TeleVision's New Year looks like bringing a big bang. It will certainly get off to a flying start with the launching of British television's most spectacular series - the £3 million odyssey called "Space: 1999". 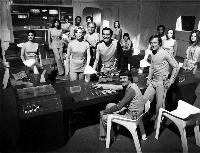 The cast are pictured here assembled in their Lunar Base - at Pinewood Studios, Buckinghamshire. Situation: The Moon is blown to pieces when atomic waste dumped from Earth explodes. The 300 people living on Moonbase Alpha are thrown out of orbit into Space, and their adventures and misadventures on a chunk of runaway Moon will take them through a series of twenty-four shows. The producers are husband and wife team Sylvia and Gerry Anderson, makers of the puppet dramas "Thunderbirds" and "Supercar". The Associated TeleVision backed series is due on the screens in early spring. 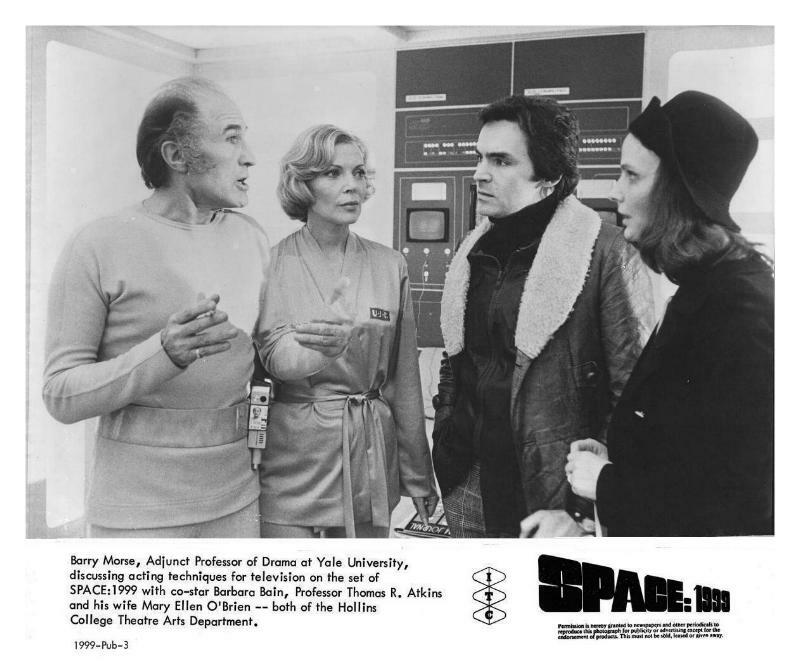 The stars are another husband and wife team, Martin Landau as commander of Moonbase Alpha, and Barbara Bain as Dr Helena Russell, boss of a skilled medical team. Gerry Anderson promises spectacular effects never attempted before on TV. The cast of Space Brain including Carla Romanelli (and from Troubled Spirit fellow Italian guest star Giancarlo Prete, partially hidden behind Barry Morse). Note that in January 1975 the UK premiere was still scheduled for spring- it was put back 6 months until autumn. Thanks to Mark Spalding. 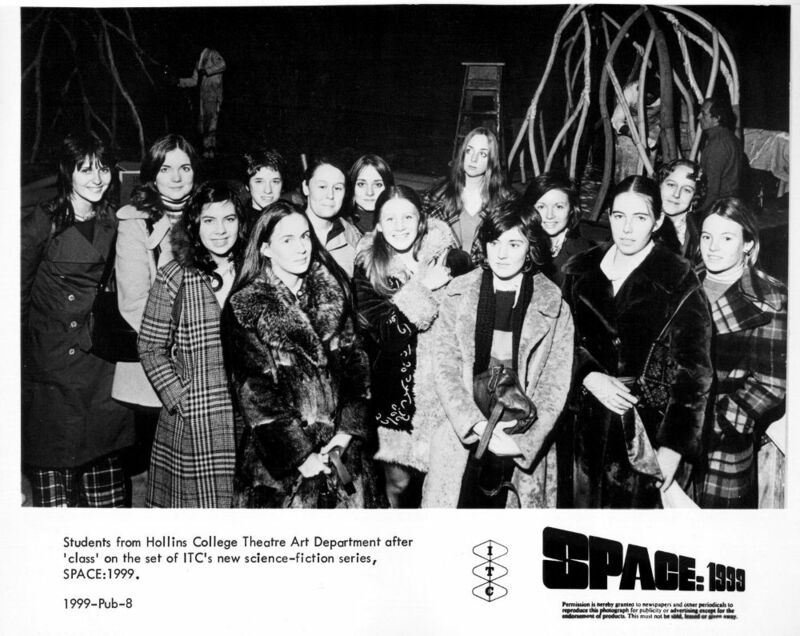 Hollins College is a private university for women in Virginia. It has a long established international study programme in London and Paris. 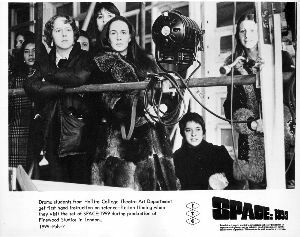 In January 1974, the chair of the college Theatre Arts Department, Professor Thomas R Atkins, took a group of students to the set of Space: 1999 during the filming of Matter Of Life And Death. He was accompanied by his wife and fellow acting teacher Mary Ellen O'Brien. An article by them was published in the magazine Cinefantastique - Volume 4, No. 4, 1975. Atkins was editor and publisher of "The Film Journal". 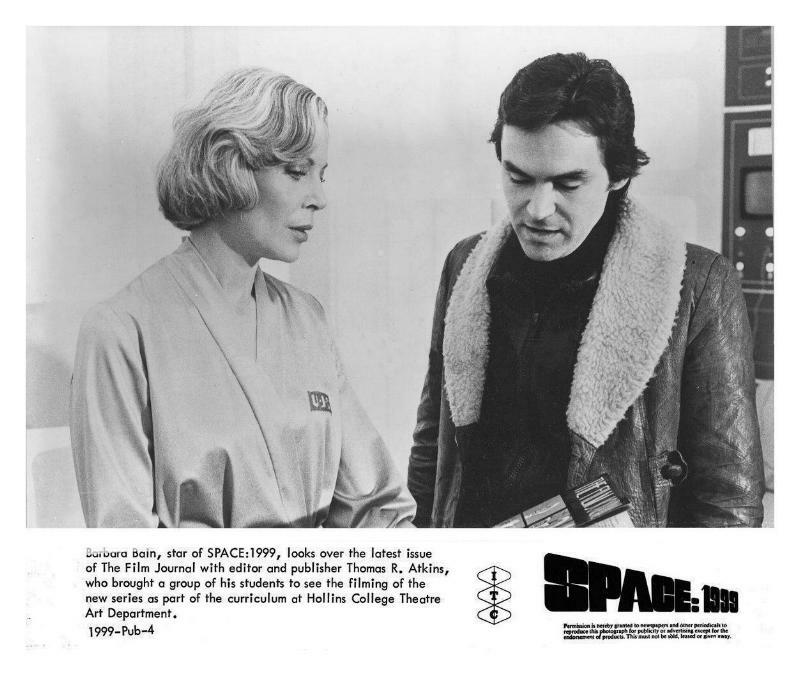 He edited the book Science Fiction Films, published in 1976 by Simon & Schuster. In 1997 both he and O'Brien appeared in the cast of the film Night Orchid, directed and written by their son Mark Atkins.